Most people would never have heard of China’s first emperor were it not for the 1974 chance discovery of a vast army of terra cotta figures that had lain underground for more than two millennia. The emperor’s silent army is now famous, hailed as one of the most important and immense archaeological finds of the 20th century. But what was the purpose of the awe-inspiring yet puzzling ranks of thousands of larger-than-life-sized model warriors? The answer lies in nothing less than a struggle for mastery, not only over death but over the world and, indeed, the whole universe; for the First Emperor meant to become a god and acted accordingly. 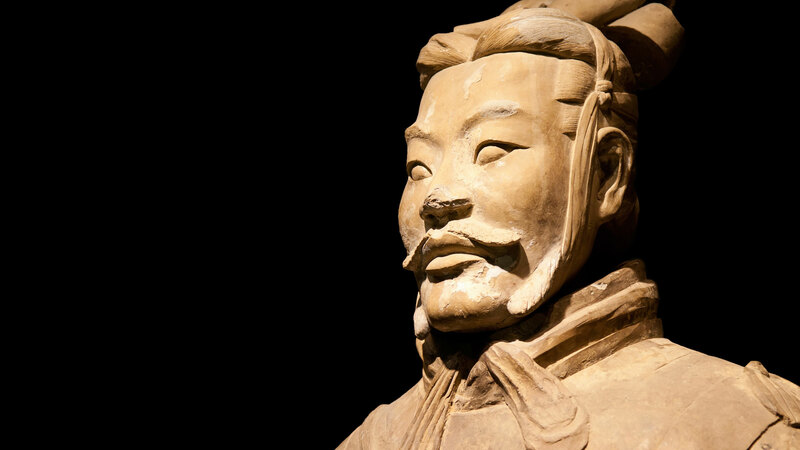 The first supreme ruler of China pursued both immortality and personal deity with an unequaled, single-minded passion, and his Terra Cotta Army speaks to that hubris. The Terra Cotta Army, chanced upon by farmers excavating a well, lies buried in a vast pit about a kilometer (less than a mile) from a great funerary mound in east-central China. A thousand clay warriors have been unearthed so far, with an estimated five to seven thousand more still buried in unexcavated sections of the pit. In an area ultimately covering more than 55 square kilometers (or 21 square miles), archaeologists uncovered three more pits and various artifacts including war chariots and the remains of real horses; model charioteers and stable boys; numerous bronze birds; and lifelike images of court officials, musicians, a juggler and a wrestler. The area is still under excavation, but the gigantic tomb-mound itself promises the most interesting revelations. The initial find, near present-day Xi’an, led to a prodigious archaeological undertaking and to the site becoming a major tourist attraction and the subject of several international exhibitions. Fascination with the First Emperor is also reflected in popular Chinese culture. He is the central character in entertainment such as Zhang Yimou’s film Hero (2002) and Tan Dun’s opera The First Emperor (2006). Who was the man who envisaged the breathtakingly immense mausoleum and Terra Cotta Army, and what were his motives? The Chinese have long been familiar with the First Emperor through the annals of their ancient and revered historian Sima Qian. Ying Zheng was born in 259 B.C.E. and was just 13 when he succeeded his father as king of Qin, one of six states comprising ancient China. The new king soon undertook, systematically and ruthlessly, the conquest of the other five states, thus unifying China in 221 B.C.E. He renamed himself Qin Shi Huang Di (Shi Huang Di meaning “First Emperor”), later shortening it to Qin Shi Huang. The First Emperor prided himself on the unity and order he brought to what had previously been six feuding regions. He established a rigid administrative system of 36 provinces and numerous districts, which despite countless modifications over the centuries is recognizable in the modern-day Chinese administrative system. Shi Huang linked various defense works to form the predecessor (albeit farther north) of the Great Wall of China. He built straight roads and standardized written script, weights, measures, and even the axle widths of carts (to make traveling the rutted roads easier). Surrounded by fawning eunuchs, courtiers and administrators, the emperor was praised to the heavens. As he conducted tours of his newly united kingdom, devotees expressed their appreciation of his magnificence and wisdom in stone and bronze. They tolerated no criticism, even that implied in the annals of history. Many books were thus destroyed—a great loss to our understanding of the early history of China. The First Emperor allegedly compounded this paranoia by persecuting and executing Confucian and other scholars whose perspectives were, of course, influenced by knowledge of the past. On one occasion he is said to have executed 460 Confucians for violating his prohibitions, possibly by burying them alive, though some scholars believe that accounts of such extreme acts are biased additions to Sima Qian’s history. Ironically, the First Emperor’s determination to cheat death may have hastened his demise at around 50 years of age. He regarded mercury as a special substance with life-enhancing properties, and it appears that others may have prescribed this as an ingredient in his medicines or potions. He suddenly fell ill and died on one of numerous tours of his empire. His son and eunuchs feared that any sudden news of his death would cause political unrest, so he was transported back to his palace with only a few trusted advisers aware of the event. To disguise the smell of his decaying flesh, cartloads of dried fish were positioned to the front and rear of his carriage. It was an ignoble demise for one who had accomplished so much and had commanded near-worship. Qin Shi Huang was laid to rest in the mausoleum that, according to Sima Qian, he had begun to build when he ascended the throne of Qin. Somewhat surprisingly, the historian writes about the emperor’s magnificent mausoleum without mentioning the impressive ranks of attendants discovered outside. Though his accounts of 700,000 forced laborers and convicts working at the site have at times been written off as exaggerated, these conscripts in the building of the mausoleum were undoubtedly also involved in reproducing the emperor’s army, servants and favorite pets in terra cotta and bronze. Through sacrifices on mountains and other portentous places, the emperor believed he had thus unified the universe of spirits as well as the earthly states. He saw himself as the first of a line of rulers whose succession would last for 10,000 generations and pass down without end. All his plans notwithstanding, Qin Shi Huang’s dynasty ended with the ignominious and premature death by enforced suicide of his son, the Second Emperor, during an uprising. As this son had earlier taken the precaution of eliminating all of his siblings, the Qin dynasty ended just four years after the First Emperor’s death. If the First Emperor failed in his mission to attain immortality in this life, he had laid elaborate plans to take the next by storm. This motivation sheds light on both the mausoleum and the Terra Cotta Army. Unable to resolve his fear of death nor to realize his claim on universal and eternal rulership in this life, the “First August Thearch” (or god-ruler) determined to establish his supreme authority and power after his demise. The hubris that characterized his life thus accompanied him beyond to death itself. According to ancient Chinese concepts, death, spirits and the afterlife were not as sharply divided from the world of the living as is the case in modern Western cultures. And the afterlife could be a far more fearful and dangerous challenge than earthly existence. Would his enemies wreak revenge? Believing that people continue in the same roles after death, he had particular reason to fear the armies of the six states that he had not only defeated but massacred; thus the commissioning of an army to accompany him after death. This is probably also why the Terra Cotta Army faces east, toward a pass through which an enemy army could most easily approach the underground mausoleum—the First Emperor’s final palace. Yet the Terra Cotta Army never went into battle, and their emperor didn’t conquer death and the afterlife. Nor did he succeed in ruling the universe or anything else. Lying buried and forgotten for more than two millennia, his hollow and motionless army and servants are in fact mute testimony to the limits of human power and influence. Perhaps only one other leader in recorded history comes close to the First Emperor in terms of wealth and ambitious projects. Ancient Israel’s King Solomon predated Shi Huang by several centuries. “I made great works,” Solomon wrote. “I built houses and planted vineyards for myself. I made myself gardens and parks, and planted in them all kinds of fruit trees. I made myself pools from which to water the forest of growing trees. I bought male and female slaves, and had slaves who were born in my house. I had also great possessions of herds and flocks, more than any who had been before me in Jerusalem. I also gathered for myself silver and gold and the treasure of kings and provinces. I got singers, both men and women, and many concubines, the delight of the children of man. “So I became great and surpassed all who were before me in Jerusalem. Also my wisdom remained with me. And whatever my eyes desired I did not keep from them. I kept my heart from no pleasure, for my heart found pleasure in all my toil, and this was my reward for all my toil” (Ecclesiastes 2:4–10). Still, Solomon could have told the First Emperor that his lavishly outfitted mausoleum and his clay army would be useless to him: “No man has power to retain the spirit, or power over the day of death. There is no discharge from [that] war, nor will wickedness deliver those who are given to it” (Ecclesiastes 8:8). Solomon spoke about “the spirit” of an individual. What he understood stands in stark contrast to the First Emperor’s view of life and the afterlife: “For what happens to the sons of men also happens to animals; one thing befalls them: as one dies, so dies the other. Surely, they all have one breath; man has no advantage over animals, for all is vanity. All go to one place: all are from the dust, and all return to dust. Who knows the spirit of the sons of men, which goes upward, and the spirit of the animal, which goes down to the earth?” (Ecclesiastes 3:19–21, New King James Version). And again, “The dust returns to the earth as it was, and the spirit returns to God who gave it” (Ecclesiastes 12:7). Solomon had a very different, almost opposite, viewpoint from that of Shi Huang. He understood that no mortal can overcome the finality of death. Whereas the First Emperor believed that the afterlife is a continuity of and analogous to this life, Solomon didn’t. He believed that the dead have no influence either in this life or after death: “For the living know that they will die; but the dead know nothing, and they have no more reward, for the memory of them is forgotten. Also their love, their hatred, and their envy have now perished; nevermore will they have a share in anything done under the sun. . . . Whatever your hand finds to do, do it with your might; for there is no work or device or knowledge or wisdom in the grave where you are going” (Ecclesiastes 9:5–6, 10, NKJV). Solomon’s understanding of the human spirit is interesting when we reflect on whether there is a future for those who have died—including China’s First Emperor. In the book of Ecclesiastes, the ancient king of Israel gives us an important part of the answer to the question “What happens after death?” There are tantalizing comments that “the spirit returns to God who gave it,” even though the dead have no knowledge or awareness “under the sun” or “in the grave.” Solomon’s book is focused on this life, however—on what he saw as its futility and its inevitable end. So to understand more about whether humans will ever overcome death, we need to augment King Solomon’s understanding elsewhere. Another ancient individual of great wealth, wisdom and knowledge was Job. He lived long before Solomon yet had a similar understanding about the human spirit: “It is the spirit in man, the breath of the Almighty, that makes him understand” (Job 32:8). This seems to be the mysterious spiritual element that not only powers human reasoning and moral intellect but, as Solomon reflected, is also what is preserved after death. What does God do with it then? Job appeared to understand something very profound as he reflected on this: “Oh, that You would hide me in the grave, that You would conceal me until Your wrath is past, that You would appoint me a set time, and remember me! If a man dies, shall he live again? All the days of my hard service I will wait, till my change comes. You shall call, and I will answer You; You shall desire the work of Your hands” (Job 14:13–15, NKJV, emphasis added). Job knew that God would not bring back his decayed flesh and bones. He was aware, though, that the human spirit is the individual essence of each person, an understanding that Solomon apparently shared with him. It is this that God preserves, as Solomon observed. The “change” that Job looked to, and the one that would have given the First Emperor a different hope, is the same one preached throughout the pages of the New Testament. It is a resurrection from the unknowing, unconscious condition of death. “For if we have been united with him in a death like his [Christ’s], we shall certainly be united with him in a resurrection like his” (Romans 6:5). The apostle Paul believed and taught that death is not the end of human hope. He consistently spoke of the ultimate resurrection of all human beings. The Terra Cotta Army bears silent witness to one man’s colossal yet vain endeavors to conquer death. The First Emperor of China failed, like all others who have tried. He did not become a god, nor did he conquer death, the afterlife or the universe. According to the words of Solomon, Job, Paul and other biblical writers, there is, however, a hope for the ancient emperor and all who have died—even those who never knew of the gospel, or “good news,” that Paul preached. That hope is the rekindling of the human spirit of each human being through a yet future resurrection of the dead. With deep sadness we inform readers that David Lloyd succumbed to cancer on April 26, 2008. He will be greatly missed by all who had the privilege of knowing him and working with him. British Museum, “The First Emperor: China’s Terracotta Army” (2007). Sima Qian, Records of the Grand Historian, translated by Burton Watson (1993). Insight: What Happens When You Die?